JUNE 3--Sheikh Omar Abdel-Rahman laughed at the ease with which his legal team improperly smuggled messages that allowed the Muslim extremist to continue directing terrorist operations while serving a life sentence in a Minnesota prison cell, according to a sealed FBI affidavit obtained by The Smoking Gun. Abdel-Rahman joked that "trained doves" were transporting messages to his disciples. "I really would like that they arrest those doves. I wish that one day I read, 'The FBI was able to arrest the doves that are contacting the Sheikh.'" The convicted terrorist then added, "as long as the government is using secret evidence we will use secret doves." The FBI document provides the first detailed account of the system by which the blind Egyptian cleric secretly exchanged messages with fellow members of the Islamic Group (IG), a Mideast terror organization in league with Osama bin Laden's al-Qaeda and Egyptian Islamic Jihad. In April, lawyer Lynne Stewart, interpreter Mohammed Yousry, and Ahmed Abdel Sattar, whom federal prosecutors describe as IG's one-man "communications center," were charged with conspiring to provide material support for a terrorist organization for their alleged role in facilitating Abdel-Rahman communiques. All three have pleaded not guilty. While Stewart and Yousry have been released on bond--$500,000 and $750,000 respectively--Sattar is being held without bail. Citing a judicial protective order covering the FBI affidavit, Susan Tipograph, Stewart's attorney, declined today to answer TSG questions regarding the sealed document. According to Whittle, during one prison visit with Abdel-Rahman--as the convicted terrorist leader improperly dictated messages to Yousry in Arabic--Stewart "made random comments out loud for the guards to hear in order to conceal the real conversation" between the sheikh and the interpreter. As Abdel-Rahman and Yousry conversed, Stewart interjected stray statements like, "Yes, the uhm...I am talking to you about...him going out on a, uh, chocolate eh...heart attack here," according to the FBI affidavit. The document also alleges that, while prison guards patrolled nearby, Stewart was observed "pretending to take notes on her legal pad." Stewart, Abdel-Rahman, and Yousry "shared laughs" about the "fine acting job that she was doing in successfully tricking the guards," according to the affidavit. Remarking on that performance, a hidden government listening device recorded Stewart saying, "I can get an award for it." Translating Stewart's flip comment, Yousry told Abdel-Rahman, according to Whittle's affidavit, "She is saying, Your Eminence, that she can get an award for acting (all three laugh). Alright, fine now, they [the guards] are stepping back." Because of U.S. government concerns that Abdel-Rahman would try and pass messages while incarcerated, he has been barred from communicating with virtually anyone, including family members. Known as Special Administrative Measures (SAM), these restrictive conditions were designed by the Department of Justice to protect "persons against risk of death or serious bodily injury" by "significantly limiting the inmate's ability to communicate (send or receive) terrorist information." And while lawyers for Abdel-Rahman were allowed to meet with him (and speak on the telephone), they were required to sign affirmations agreeing to abide with SAM provisions before being granted access to Abdel-Rahman. Those SAM rules note that attorneys could "only be accompanied by translators for the purpose of communicating with inmate Abdel-Rahman concerning legal matters." But SAM restrictions did not stop Abdel-Rahman from attempting--often successfully, it seems--to stay in touch with leaders of the Islamic Group, for which he remains the militant organization's spiritual leader. Embracing a radical interpretation of Islam, IG seeks to overthrow Egypt's government and replace it with an Islamic state, and brands as "infidels" any individual, group, or country that does not share its fundamentalist views (Israel and the U.S., of course, top IG's hit list). The organization has close ties with al-Qaeda, and bin Laden has frequently cited Abdel-Rahman's imprisonment as one of the many reasons for his group's attacks. IG was implicated in the 1981 assassination of Egyptian president Anwar Sadat and plotted the murder of his successor, Hosni Mubarak. IG also took responsibility for the savage massacre of 58 tourists and four Egyptians visiting an archeological site in Luxor, Egypt in November 1997. The killers left behind leaflets calling for the release of Abdel-Rahman (one flyer was stuffed inside the body of a victim whose torso was slit). 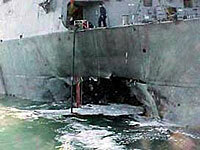 Seventeen sailors were killed in the October 2000 attack on the U.S.S. Cole. In October 1995, a federal jury convicted Abdel-Rahman, 63, of engaging in a seditious conspiracy that included the 1993 World Trade Center attack and the foiled plot to bomb New York City landmarks, including the United Nations and the Lincoln and Holland tunnels. He was also convicted of trying to arrange Mubarak's assassination. Sentenced to life imprisonment plus 65 years, Abdel-Rahman was held, until recently, at the Federal Medical Center in Rochester, Minnesota. It was there that, in February 2000, FBI agents secretly began videotaping Abdel-Rahman's legal visits (bugging of his telephone calls with lawyers began in June 2000). The eavesdropping was conducted under the Foreign Intelligence Surveillance Act (FISA), which, in the name of national security, authorizes secret electronic surveillance aimed at gathering foreign intelligence. The initial Minnesota warrant came 15 months after the FBI began FISA surveillance on the home telephone of Sattar, whose e-mail and fax traffic was also later intercepted by government agents. The sealed FBI affidavit, drafted in support of a warrant for the search of Sattar's Staten Island apartment, makes it clear that Sattar was the maypole around which communication to and from the imprisoned Abdel-Rahman revolved. A 42-year-old postal worker who worked as a paralegal during the blind terrorist's federal trial, Sattar was in frequent contact with IG leaders worldwide, including Rifa'i Taha Musa and Abdel-Rahman's son Mohammed. In September 2000, Al Jazeera television broadcast an interview with bin Laden, his deupty Ayman Al-Zawahiri, Musa, and Mohammed Abdel-Rahman, during which the men "pledged jihad to free Sheikh Abdel-Rahman, among others, from incarceration in the United States," according to the FBI document. In February 2000, Sattar arranged a legal visit to Abdel-Rahman for an unnamed lawyer (identified in the affidavit as "Attorney #2") and Yousry, the interpreter. According to the FBI, Sattar had Yousry deliver messages to Abdel-Rahman, who, in turn, dictated letters and communiques to Yousry. On the agenda for the February visit was the delivery of a cryptic message from Musa regarding a "poem" that needed to be read to Abdel-Rahman. Musa also wanted Abdel-Rahman's opinion on the possible revocation of an IG cease-fire that had been in effect since the Luxor massacre. But the legal visit did not go as planned, the FBI affidavit notes, because Abdel-Rahman was "uncomfortable speaking to Yousry about IG matters in front of Attorney #2, who also spoke Arabic." In a subsequent conversation with Mustafa Hamza, IG's Operations Chief, Sattar said that the lawyer "would not allow the letter to be read for fear that they would get caught" and "all visits would be canceled if the authorities felt anything was wrong." Sattar, the affidavit reported, told Hamza he "was very mad at Attorney #2 and does not intend to send him to the next visit with Sheikh Abdel-Rahman." Then, referring to Abdel-Rahman's other attorneys, Sattar told Hamza, they "have no problems, I mean the Americans, they let you say whatever you want, do what you want, write what you want." When Sattar began arranging a mid-May legal visit, he called Yousry to inform the interpreter that Stewart--and not Attorney #2--would be traveling with him this time to Minnesota. It was during that visit that the FBI recorded Stewart allegedly commenting on her acting abilities. Abdel-Rahman claimed a little birdie whispered in his ear. Attorney #2, though, did participate in a wiretapped October 2000 conference call during which Abdel-Rahman discussed an IG fatwah, issued in his name, that urged "the Muslim nation to fight the Jews and to kill them wherever they are...Every Moslem should wage Jihad against them." Though Abdel-Rahman had not actually authored the fatwah, he did not want his followers to confirm or deny this fact, since the controversy triggered by the fatwah "is good talk." As for how the edict was delivered, Abdel-Rahman was also content to leave that a mystery, prompting Attorney #2 to remark that the inmate had "trained doves that transport messages." The lawyer then joked, "Am I cleared to tell The New York Times about the doves?" He then noted, "We better tell the government that if they stop using secret evidence we will stop using doves." The last prison visit detailed in the FBI affidavit occurred in mid-July 2001. Stewart and Yousry traveled to Minnesota and met with Abdel-Rahman over a two-day period. On July 13, Yousry told Abdel-Rahman that "they" had paid $35,000 for a taxi cab, using money the interpreter was holding. The FBI document offers no other details or insight into the cab purchase. The interpreter then read a letter from Sattar addressing the IG cease-fire and financial help provided to Abdel-Rahman's family. According to the affidavit, Yousry then asked Stewart if he could talk to Abdel-Rahman "about an issue relating to the bombing of the U.S.S. Cole." Stewart consented, the document notes. Yousry then reported that "some people" had spoken to Sattar about the attack on the Navy destroyer, "and said that they did this operation for Omar Abdel-Rahman so he could be released from prison." The October 2000 attack in Yemen killed 17 sailors. Yousry continued, saying that Sattar's contacts asked him "to do some negotiations with the American government and tell them, 'If [Rahman is] not released we'll execute another operation.'" Abdel-Rahman advised that a lawyer, and not Sattar, should handle any negotiations, otherwise Sattar "would be bitten by them," an apparent reference to law enforcement scrutiny. The FBI affidavit notes that Stewart voiced agreement with Abdel-Rahman's analysis, adding that she told Sattar "there was a time to be a hero, but that this was not it."